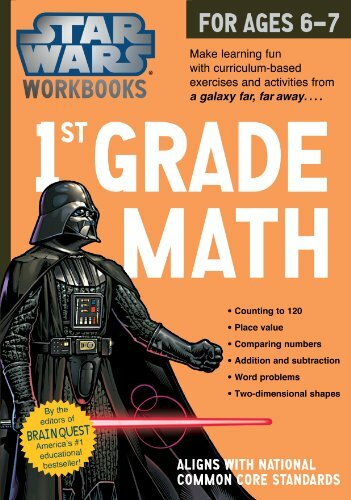 Star Wars Workbook - Grade 1 Math! Dimensions 0.25 by 8 by 11 in. Amazon.com description: Product Description: Learn well, you will. Make learning an intergalactic adventure! From the creators ofÂ BRAIN QUEST, America's #1 educational bestseller, and from the iconic world ofÂ Star Wars,Â 1st Grade MathÂ is 96 fun-filled pages of curriculum-based exercises and activities. It reinforces key math concepts, including addition and subtraction, counting by 1s and skip counting, two-dimensional shapes, and more. About: Learn well, you will.